This is a variable genus, and one of the wonders of Australian Native Plants. 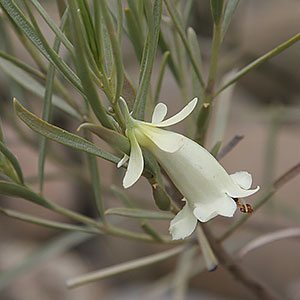 Eremophila are drought tolerant plant, they vary from low growing prostrate ground covers such as Eremophila biserrata and E. subtereifolia plants to small shrubs such as E. laanii and E. maculata. Commonly referred to as the Emu bush, the genus also varies greatly in both foliage and flower colour. They are found in semi-arid and arid regions of Australia, they are also referred to as, Fuchsia Bush, Tar bush and Turpentine Bush. Foliage varies from green through to silver, and flower color from white to deep reds with many spotted varieties as well. E. Warnesii for example, has great grey green foliage and nice purple flowers. Basic care requirements for all varieties are a well drained soil and a sunny position. In cooler climates they can be grown in containers where drainage can be controlled and plants can be positioned in a sunny position in all seasons. They can tolerate a wide range of soil types, however never waterlogged or poorly drained soils. They grow well in poor soils, a low phosphate native plant fertilizer can be used, but use sparingly. For those gardeners living in the eastern states, especially in more humid areas, look for grafted plants for best performance. Eremophila can be pruned to preserve a bushy shape. They are best pruned directly after flowering and then lightly. Propagation is from seed and also by grafting. In general they first well into the native garden, they can also be grown in the the general garden border with plants that grow in similar conditions. E. glabra and E. densifolia are two varieties suitable as ground cover plants. E. nivea is both much sought after by collectors, purple tubular flowers and good silvery foliage. They are a colourful flowering native plant, the flowers do produce nectar which attracts honey eating birds as well as butterflies to the garden. 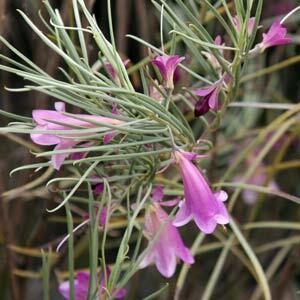 Eremophila or ‘Emu Bush’ are increasingly popular as garden plants. With grafted varieties now available, growing Eremophila has become a simpler process. E. flaccida has purple flowers with a mauve calyx. E. delisseri and E. nivea are both much sought after by collectors. E. nivea has purple tubular flowers and good silvery foliage. E. glabra and E. densifolia are suitable as ground cover plants. Available to buy online from Mail Order Nurseries and good garden centres. E. maculata is widely found in cultivation, sometimes called the spotted emu bush, a compact form is available..
E. longifolia is the long leafed emu bush with a slight weeping habit.